Are you ready to bring out the best in your body? Join us at Ann Arbor’s top mind body fitness and wellness studio. Let us create your customized program. MOVE Wellness Studios specializes in Pilates, a contemporary approach to the mind-body exercise method that was pioneered by Joseph Pilates more than 85 years ago. Pilates is suitable for all bodies at every stage of life and is a modifiable system of more than 500 exercises performed on a mat or using specialized equipment, called The Cadillac, Reformer and Chair. Our trainers work with a range of clients from elite athletes, people recovering from injuries and those interested in building a conditioning program that is efficient, effective and safe. The reason co-owner Elaine Economou teamed up with AFC Ann Arbor wasn’t just because her 11 year-old loves soccer. She also wanted to extend MOVE Wellness Studios’ philosophy to members both inside and outside of the community. “Live a joyful life in a fit and healthy body.” is the motto at Move and that’s exactly what the members of AFC Ann Arbor can expect. These soccer players get to do what they love day in and day out and we help them get ready for their next match or to recuperate from the previous one. We are honored to be able to support the team this year and we appreciate the spirit they’ve brought to our community – now it’s time for us to give back. The GYROTONIC® and GYROKINESIS®methods are complementary exercise methods that fall under one umbrella – the GYROTONIC EXPANSION SYSTEM®. Both methods were developed by Juliu Horvath, an ethnic Hungarian, professional dancer from Romania. Horvath suffered a series of debilitating injuries during his dance career, and began developing what are now known as the GYROTONIC® and GYROKINESIS® Methods as a way to heal himself and regain his strength and agility. GYROTONIC® exercises are performed on custom-designed GYROTONIC® equipment, whereas GYROKINESIS® exercises are performed on a mat and chair. Both exercise sequences are composed of spiraling, circular movements, which flow together seamlessly in rhythmic repetitions, with corresponding breath. Each movement flows into the next, allowing the joints to move through a natural range of motion without jarring or compression.These carefully crafted sequences create balance, efficiency, strength and flexibility and is really is something anyone can do; young or old, fit or unfit. 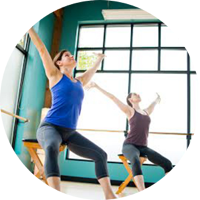 “Your class has been wonderful, it has made me aware of my body, that I have become stronger; I plan a lifetime commitment to Pilates.” Daphne H.
“I have learned so much about proper movement and core strengthening at this facility. Every instructor that I have met and worked with has been professional in their approach, yet seem to have very open hearts. I would highly recommend it to anyone seeking better health and core strength.” Dr. Steve M.
“I feel stronger and fitter than I ever have, and I have a new-found respect and, dare I say it, affection for my body – pretty remarkable for a 50-year-old woman.” Elizabeth S.
Enter your name and email and be the first to know about move specials and health & wellness tips. 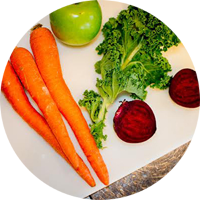 Includes intro private session, wellness visioning session, and juice/smoothie!